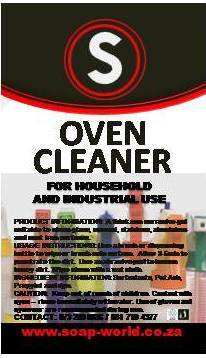 Soapworld Oven Cleaner is a non abbrasive oven, grill and braai cleaner. USAGE INSTRUCTIONS: Use a brush or dispensing bottle to brush or wipe Soapworld Oven Cleaner onto surface. Allow 3 - 5 min to penetrate the dirt. Use an abbrasive pad to lift heavy dirt. Wipe clean with a wet cloth.